Preheat oven to 160°C/320°F. Finely dice onion. Roughly chop garden cress. Thinly slice radishes. Cut a hole in the middle of the bread slices using a cookie cutter. In a large bowl, mix together sour cream, crème fraiche, radish, onion, and garden cress. Season to taste with salt and pepper. In a large ovenproof frying pan, toast bread in some butter over medium heat for approx. 1 – 2 min. per side. 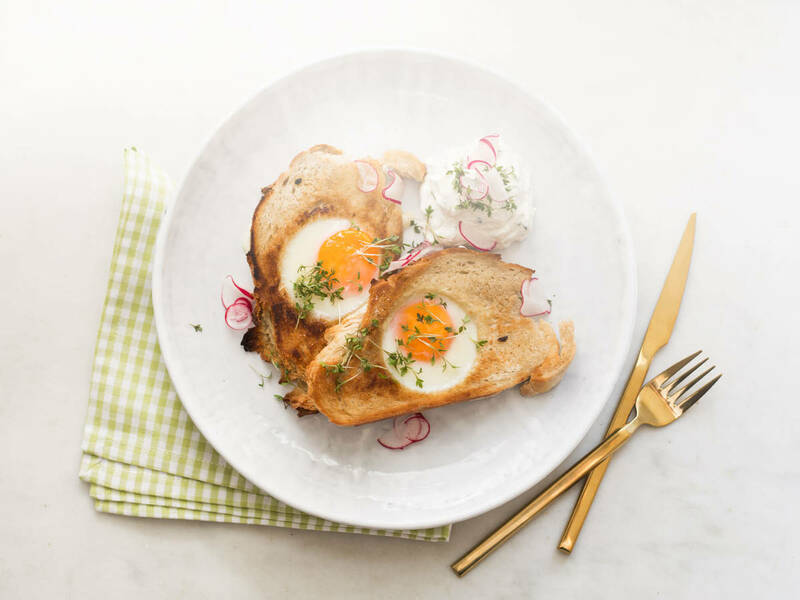 When lightly toasted on both sides, crack an egg into the center of each piece of bread and transfer pan to preheated oven and bake at 160°C/320°F for 3 – 5 min. until egg white and yolk are slightly firm. Season to taste with salt and pepper. Serve with radish and cream dip. Garnish with garden cress. Enjoy!